If you own or run a company that provides professional services—whether it’s a consulting firm, an advertising agency, a media and entertainment company, or any other type of professional services firm—then you probably face specific business challenges that entrepreneurs in other industries may not fully grasp. Below are five HR opportunities that can help your professional services firm succeed. Your people play a vital role in your company’s success. Having the right talent on your team is especially vital when your employees’ time and expertise are what your clients are buying. Your success in recruiting and retaining the best talent in your industry impacts your business’s ability to produce quality results for your clients. Solution: Give employees what they want! Talented professionals are often on the hunt for the comprehensive employee benefit plans offered by much larger companies. These benefits include everything from health care, dental and vision insurance to retirement services such as a 401(k) plan, and even voluntary benefits like employee assistance programs or pet insurance. One way to offer your employees the same quality and variety of benefits as your larger competitors is by using a professional employer organization (PEO). In addition to competitive benefits, a PEO can often provide your employees with dedicated HR support when they have questions, making their lives easier and freeing you from spending valuable time on certain day-to-day HR administration. Professional services firms face HR challenges that those who aren’t immersed in the industry may not fully comprehend. Having access to a dedicated team of HR experts who specialize in working with firms in your industry can be invaluable. These experts can help you proactively and effectively resolve HR issues that affect employee recruitment and retention over the long-term. For example, having a trusted advisor for guidance on building a positive company culture, improving employee onboarding and optimizing talent management can have a positive impact on employee retention. Solution: We recommend looking for an HR solution that includes access to a client services professional who can help you navigate HR questions and find solutions. As the number of employees you have increases, you may also benefit from access to an expert HR team with deep understanding of the professional services industry. TriNet, for instance, differentiates itself from other PEOs in that our HR experts are TriNet certified in HR for the professional services industry. Breaking away from the “one size fits all” mold commonly found among HR service providers gives professional services firms access to a trusted HR partner who understands the specific challenges unique to their industry. Too many professional services firms find themselves doing the last thing they should be doing: wasting time and money stitching together their HR from various products, services and vendors—and still not truly getting their HR needs covered. They may have their payroll done by one vendor, purchase their health benefits from another and use yet another for retirement plans. Then they have to find various products to help them with expense management, performance management and applicant tracking. Additionally, they may still require dedicated HR support for managing day-to-day administrative HR tasks. Solution: What professional services firms really need is the peace of mind that comes from having a bundled HR solution that helps them minimize time and costs spent on HR administration, compete for top talent and maintain compliance. To best serve the needs of companies in the professional services industry, this bundled solution should contain comprehensive benefits, payroll administration and other key HR features such as performance management, applicant tracking, time and attendance, and expense management. HR administration can be time-consuming and costly, even when things are going well. This is why it’s important for professional services firms to protect their business from common employment liabilities, such as wrongful termination or discrimination and harassment claims. Additionally, it can be very time-consuming, even for a large firm with internal HR support, to keep up with the numerous and ever-changing employment rules and regulations relevant to their industry, size and geographic location. Solution: Work with a team of HR experts who understand your industry and can help your firm with comprehensive HR compliance and proactive employment related risk mitigation capabilities including multi-state compliance support, employment practices liability insurance (EPLI) and active claims management. No business can afford to waste time. However, when your billing sheets have to account for how you spend nearly every minute, it is even more crucial that the majority of your time—and your employees’ time—is spent in direct service of your clients. Getting bogged down on burdensome HR administrative tasks can have a negative impact on your bottom line. Time and attendance management that helps you accurately record billable time with advanced tracking of employee hours and project-based work. Streamlined design and navigation with single-system data access. Simple access to payroll administration, benefits administration and HR resources. Paperless expense management that helps automate the expense reporting and reimbursement process, including integration with popular accounting systems for improved accuracy. Performance management capabilities that help employees manage goals effectively through frequent, real-time feedback. Efficient applicant tracking that simplifies the candidate recruitment lifecycle and automates arduous hiring tasks. A mobile app for immediate access to updated HR information on the go. TriNet Professional Services is TriNet’s newest bundled solution created specifically to address the unique HR needs of professional services firms. The new solution is delivered by a TriNet certified team of HR experts who specialize in working with professional services firms and is supported by a technology platform that powers business success with improved operational efficiency, cost management and risk mitigation. 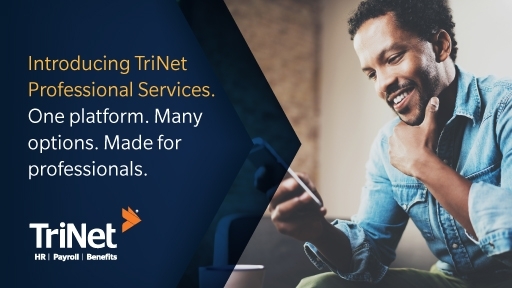 Contact TriNet to learn more about TriNet Professional Services.